For the budget and adventure traveler, we have created an exciting 3-day Kruger Budget Safari. During these 3 days, you can enjoy some of South Africa’s finest wildlife spots at an affordable rate! We call this a budget safari simply because we have made the right arrangements with key suppliers and service providers which have enabled us to reduce the cost of this safari. Other than that there is nothing budget about it. Please note that your Safari can easily be extended to 4 days or more upon request. You will be accommodated at a lodge near Phabeni Kruger Gate in en-suite rooms with air-conditioner/heater, DSTV, tea/coffee facilities, quality bedding and linen, all draped in African décor. This Kruger budget safari departs daily from Johannesburg OR Tambo airport. You need to be at the OR Tambo bus terminal by 7.30 am. We will send you full instructions when you book your safari. The shuttle departs no later than 7.45 am. You travel East passing picturesque landscapes and farmlands on route to our lodge near Kruger. There are two 15 minute comfort stops en route. You will also be able to buy snacks and refreshments during these comfort stops. ETA in Hazyview is around 1 pm. The lodge driver will meet you at the drop off point and transfer you to the lodge. This is a quick 5 to 10 minute drive. 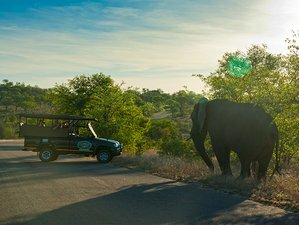 After checking in, you will have time to relax and freshen up before boarding an open-sided Landcruiser for an exciting two to two and a half hour sunset game drive in Kruger National Park. (New)Even though the full day safari on the following day is main day to search for the Big 5 and other wildlife, the Sunset Safari is a great introduction on what to expect. If you lucky, you may also also get some lovely sightings including a wonderful sunset! The lodge is about 15 to 20 minutes drive from the Phabeni Kruger Gate. After your safari game drive you return to the lodge where you can unwind, have drinks and relax. This morning you will enjoy coffee/tea and rusks before departing on full day of game viewing in the Kruger National Park (Skukuza area). A Packed breakfast is included. Game drives are in small groups in specially modified open sided land cruisers. This is the last day of your African Kruger budget safari. This morning you have a choice between another morning game drive or a relaxing at the lodge. This is an optional game drive and for own account (payable at the lodge). Just before 12 noon the lodge will transfer you to the shuttle pickup point in Hazyview. You will then return to Johannesburg with the shuttle. Comfort stops on the way. Drop off at Johannesburg OR Tambo airport around 5.30 pm. This is the end of your 3 day Kruger Budget Safari. Delicious African themed meals, special requirements adhered to. Leaves OR Tambo airport in JHB @ 7am daily.